What to Get a Teenage Boy?? 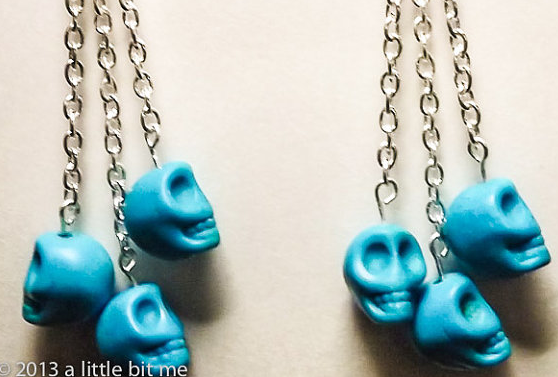 Sugar Skull Necklaces!! In our neighborhood we have befriended a few families and each of these families have teenage boys (13-17). We’ve become pretty close to them and they help us out around the yard and the house. Birthdays and holidays are difficult because they’re at that age of what to get them that is age appropriate – we don’t have kids. I’m not in tune with what a 13 year-old-boy would want. Sure – I could figure out a teenage girl – but a teenage boy? I’m out of luck!! PERFECT!! How perfect is that – this opens up a whole new door for me. 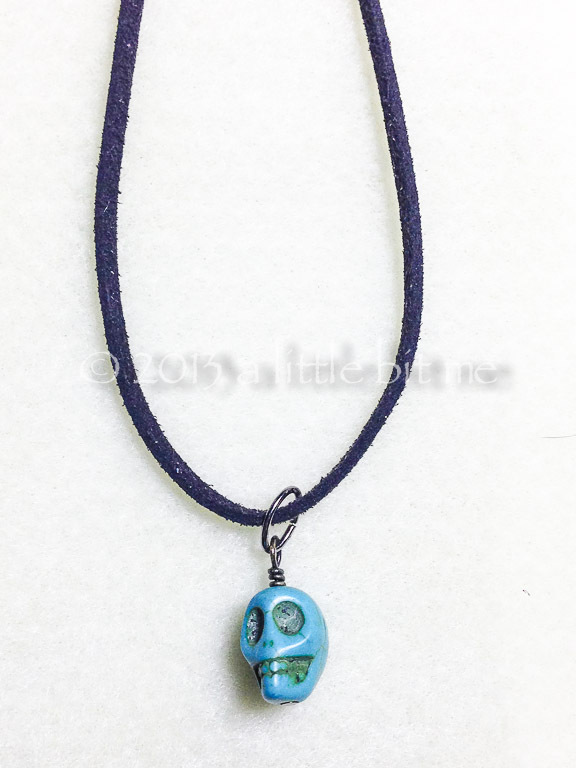 Make a sugar skull (howlite or turquoise) pendant in the color of his choice on a nice suede cord necklace. I made it for him and he loves it!! When I showed him that I had a ton of other colors – wow…he got really excited. 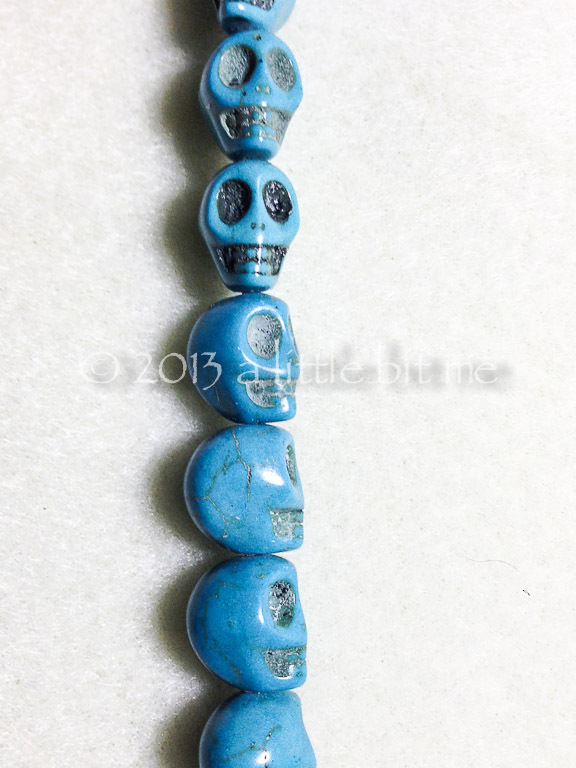 Even his dad mentioned that he would like a necklace made with the sugar skulls. Here are the details of what I made. I actually used gun-metal headpin and a gun-metal jump ring but didn’t even think about taking a photo with them. These sugar skulls are so very popular now!! I got a strand of them from my favorite local bead store for around $10 when they were on sale. So back to the creation. 🙂 Using the headpin, I added the sugar skull bead and did a simple wrapped loop attaching it to a jump ring. Once attached to the jump ring, I attached it to the necklace. Pretty easy! I could have gone fancier and made it into a nice bail – and I still may do that for future creations. He absolutely LOVES the necklace!! What do you think? 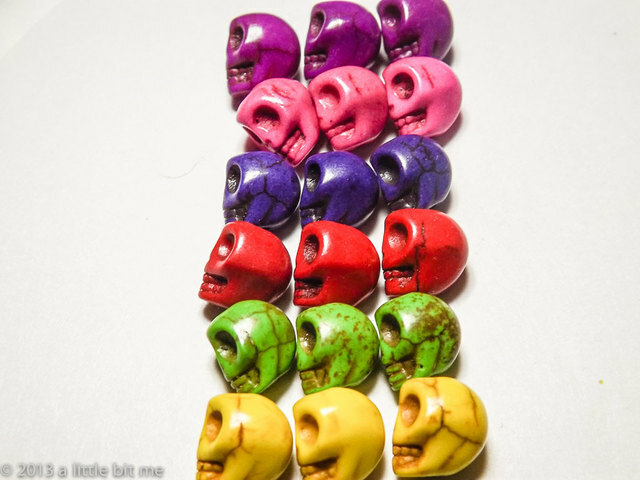 Are you into the sugar skull craze? Or are you still too into the mustache craze?? (I’ve made lots of mustache items too). Don’t forget to stop by my Facebook Page – https://www.facebook.com/alittlebitme – as I’m super close to 1,000 likes. When I reach it – I’m going to do an awesome giveaway to say Thank You!! 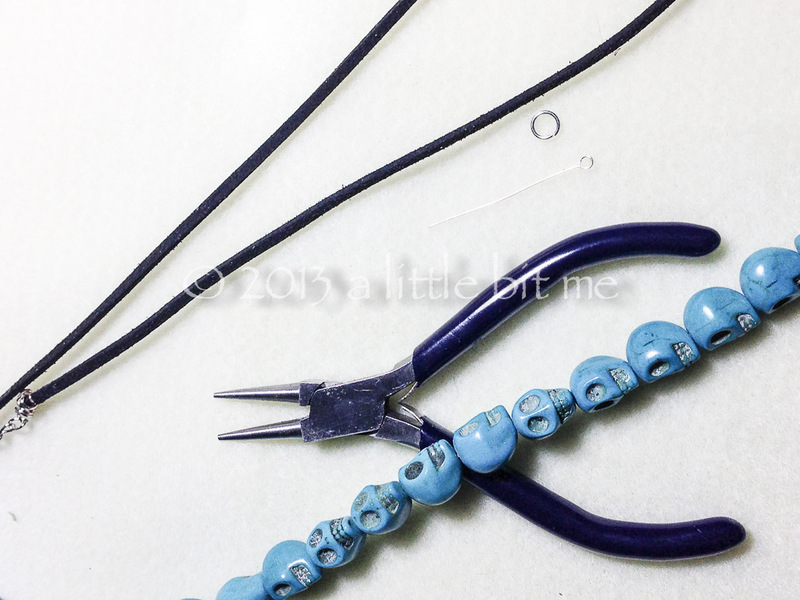 Interested in purchasing any of the materials or a completed necklace (or the earrings)? Let me know. 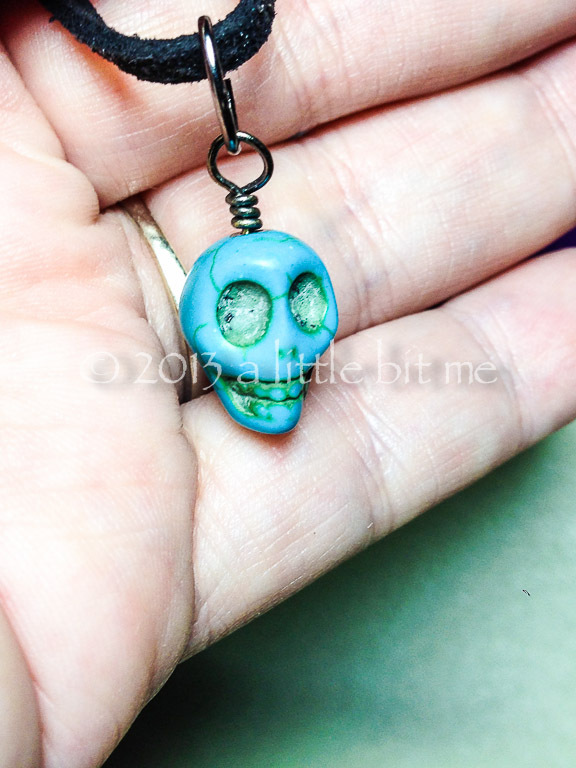 This entry was posted in Creative Stuff, Jewelry and tagged Arts, Bead, Craft, DIY, giveaway, jewelry, Necklace, Shopping, skull, Supplies by tiannafonz. Bookmark the permalink. Definitely – girls too! 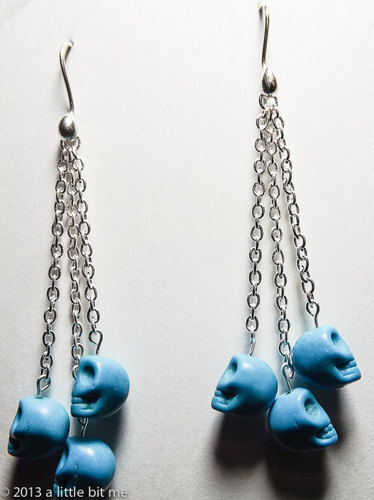 As a matter of fact – my mother is in LOVE with these skulls! !